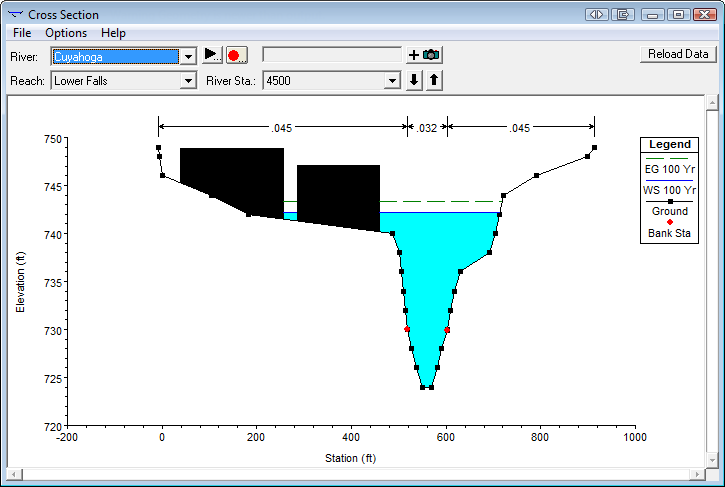 Conveyance obstructions allow the user to define areas at a cross section that are permanently blocked from conveying flow. Conveyance obstructions decrease flow area and add additional wetted perimeter where the water comes in contact with the obstruction. A conveyance obstruction does not prevent water from going outside of the obstruction. 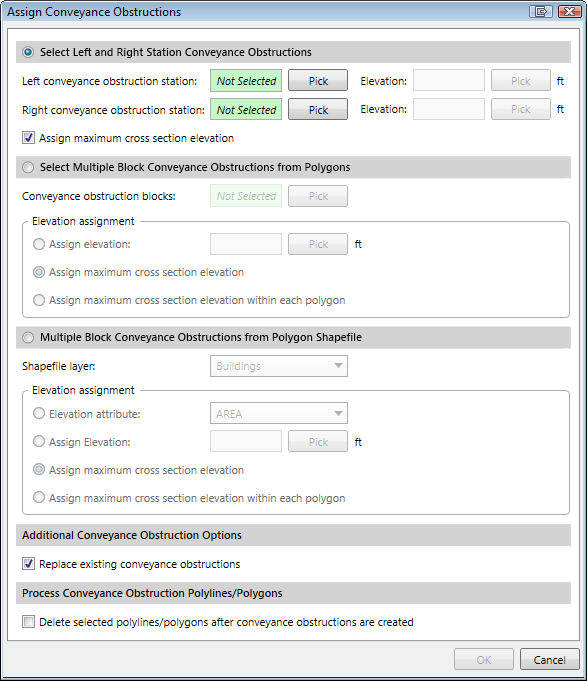 Conveyance obstructions are defined in the Cross Section Data dialog box, in the Conveyance Obstructions panel. Normal conveyance obstructions allow the user to define a left station and elevation and a right station and elevation for the conveyance obstruction. When this type is used, the area to the left of the left station and to the right of the right station will be completely blocked out. An example of this type of conveyance obstruction is shown below. Multiple blocks conveyance obstructions allow the user to define up to 20 individual blocks. With this type of obstruction, the user enters a left station, a right station, and an elevation for each of the blocks. An example of a cross section with multiple blocked obstructions is shown below. 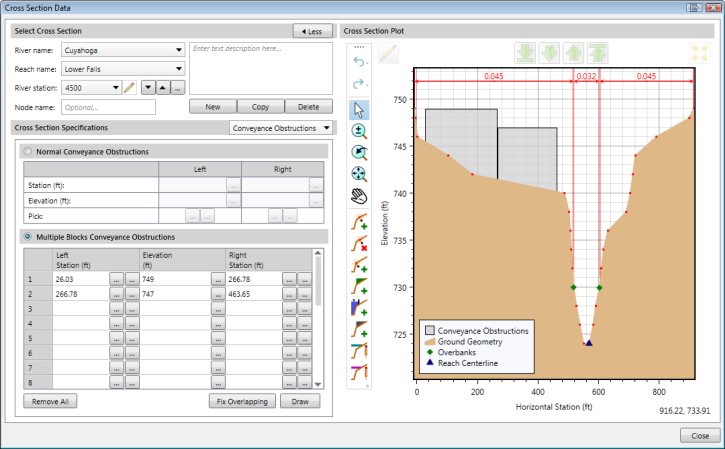 The user can use the Cross Section Data dialog box to manually define the conveyance obstructions by selecting horizontal stations and elevations for each of the obstructions. 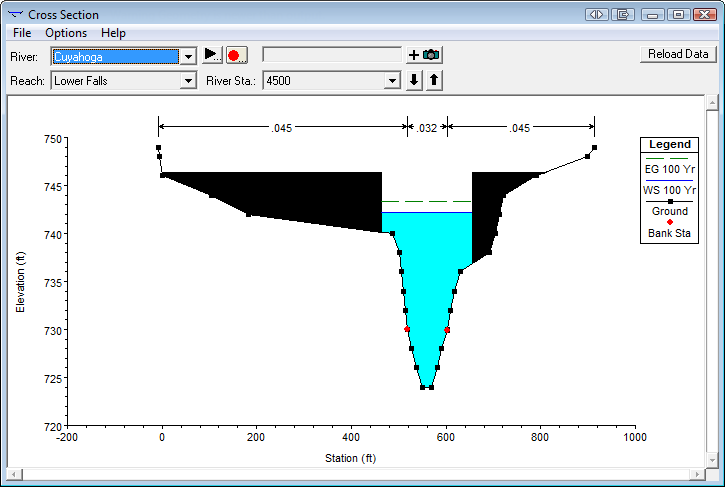 The user can select the horizontal stations from either the Map View or from the displayed cross section plot. 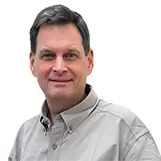 Alternatively, the user can utilize GIS polyline or polygon data to define conveyance obstructions. Select Input | Assign Entities | Assign Conveyance Obstructions to display the Assign Conveyance Obstructions dialog box. 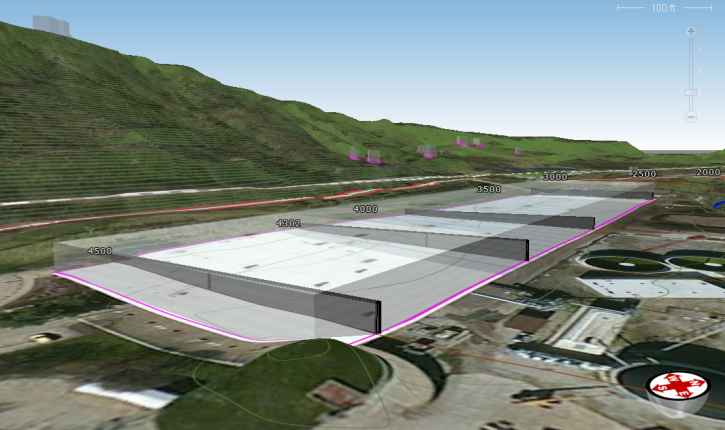 From this dialog box, the user can select GIS polyline or polygon data to define the conveyance obstructions. An example of the completed conveyance obstruction from a building is shown below.